I’d love to know what the open rates and click-through rates were on this Warby Parker email, because their email subject and call to action were razor sharp. Even better? They’re ultra-simple (and easy to copy). Did I open it? Of course I did. 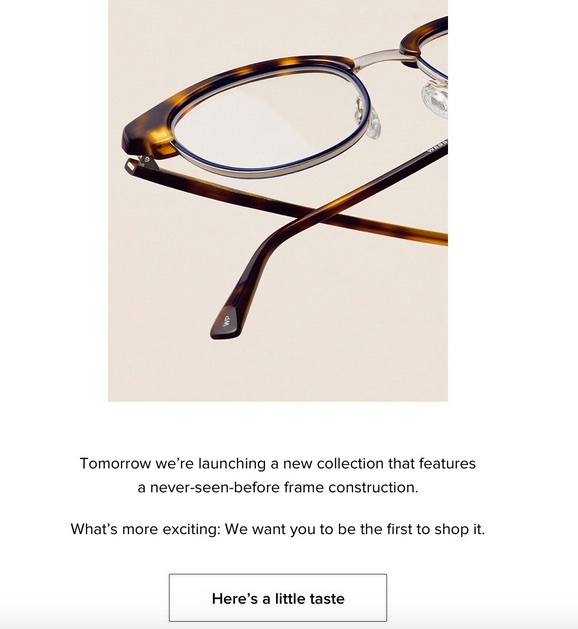 The email announces one thing: a new, “never-before seen” Warby Parker eyeglass frame design. Did I click through? Of course I did. And here’s the twist: I just bought new Warby Parker frames last month. I’m not even in the market for a new pair of glasses. And yet, even though I could have deleted this email with impunity, the email subject made me curious enough to open it, read it, click through, and tell you about it. Because the email kept creating questions that made me want to find out the answers. There’s nothing else to see and not much else to click. The pitch is all there is. So either you’re curious or you’re not. But with hooks like that, who wouldn’t be? Does This Tactic Convert to Sales? By positioning their new frames as a buzzworthy event (“never-before seen”), I’m willing to bet that the curiosity they pique today and the style in which they did it will keep them top-of-mind the next time their customers need a new pair of glasses. What question can I ask, what curiosity can I pique, or what promise can I make in my email subject line that will excite my email list enough to generate a flurry of opens? Then just make sure your email itself delivers a worthwhile payoff. … then you may also like this post about the mistake that most people make when starting a new business, or this post about why you’re having trouble selling (and how you can fix it).